Bot flies and their larvae are a common pest and parasite of horses, donkeys and mules. There are numerous species of bot flies (family Oestridae) that target equines. The most common of these is Gasterophilus intestinalis. These bot flies attach their eggs to the horse's legs and upper arms. In its adult stage, bot flies live about a week but may lay over 1000 eggs. Two other species of bot fly are reported in North America, Gasterophilus nasalis and Gasterophilus haemorrhoidalis. These species attach their eggs to the hairs in the nose (G. nasalis) and throat (G. haemorrhoidalis). In the adult stage, this winged insect looks similar to a bee, and can be seen in stables and outdoors hovering around the legs of the horse. Bot flies are very irritating to horses. They hover around the animal's legs, neck and face, and dive bomb the horse as they attempt to attach their eggs to the horse's hair shafts. Horses recognize the tell-tale buzz of the bot fly and become agitated and sometimes panicked in their presence. Bot fly eggs are attached to the hair shafts on the horse's legs, chest and face. When grooming your horse, you may notice tiny yellow specks attached to the hair on the horse's legs, neck or face. These tiny specks are the eggs of the bot fly. A single bot fly may lay as many as 1000 eggs on your horse. The eggs hatch approximately 10 days after being deposited, and may hatch in response to the moisture and warmth caused by the horse licking the area. The larvae may be ingested by the horse, or may crawl to the mouth where they can cause irritation to the gums. Subsequently, they bury themselves in the tongue, gums or lining of the mouth and remain for approximately 28 days. 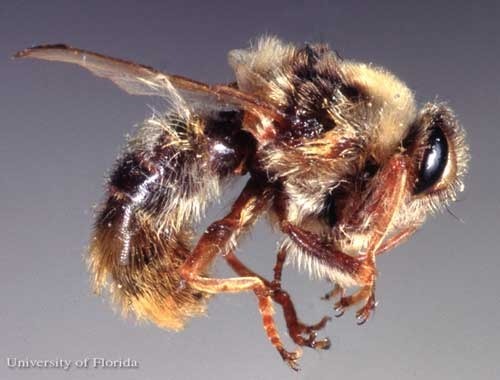 A host of health issues may result from a bot fly larvae infestation. Following this phase, the larvae molt and enter their second stage of development and migrate to the horse's gastrointestinal tract. The larvae attach themselves to the lining of the stomach and remain attached for the next 9 to 12 months. During this time, the larvae feed on the fluids from the body of the horse. Toward the later part of this period, the larvae molt again. The larvae in this third stage have grown to approximately 1/2 to 3/4 of an inch and have a characteristic yellowish color and exhibit spines that can be used to identify the species. Scientists can identify the species of bot fly by examining the size and location of the spines. 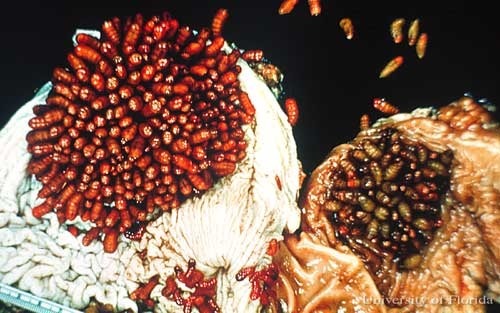 After the third stage larvae mature, they detach from the gastrointestinal tract wall and are passed in the manure. The larvae burrow into the soil or dried manure where they pupate and remain for the next one to two months. This stage of the life cycle occurs between late winter and early spring. The adult bot fly emerges in the early summer and fall. The fly has a bee-like appearance, but differs in that it has only a single pair of wings and the abdomen curves downward. 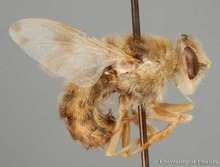 The bot fly has small, undeveloped mouth parts and does not feed during its lifetime. The curved abdomen serves as an ovipositor, used to attach eggs to the horse's coat in specific areas. How does the bot fly impact my horse's health? 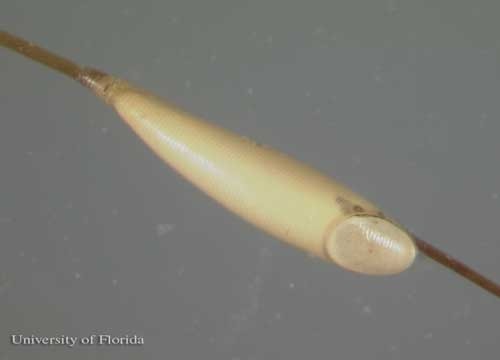 Bot fly larvae can cause dental irritation as they burrow into the gums and tongue shortly after being ingested. As they migrate to the stomach and attach to the stomach walls, they may cause ulcers. Reports of esophageal paralysis have also been reported to result from bot fly infestation. 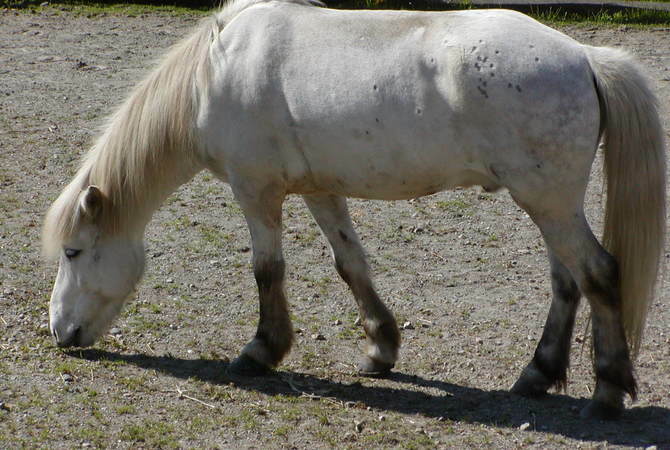 When bot fly larvae migrate through the horse's skin, they cause pock marks in the horse's haircoat. 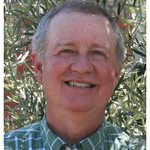 Healthy horses tolerate moderate bot fly larvae populations without external symptoms. Extreme cases, and cases with very young or old horses, may result in other gastric and intestinal disturbances such as impaction, rupture, peritonitis and anemia. What should I do if you see horse bot flies? Take note of these bee-like flies as the hover about the legs of your horse. If you see bot flies hovering around your horse, inspect your horse's legs, throat and face for the bot fly eggs. These can be removed with a bot fly knife or other scraping device. Most likely, if you have seen the eggs you should plan on dosing your horse with a dewormer that is effective in killing the larvae. Your veterinarian can recommend an ivermectin-based product that will kill the larvae. The treatment is generally timed to occur after the first hard frost of the year, normally in November or December. This is the point in time when the horse is unlikely to become reinfected and the number of third stage larvae that normally pass in the manure is minimized. How can I prevent bot fly infestation in my horse? Daily removal of manure to a distant location, or to a compost pile, will reduce the number of pupae that survive and turn into adult flies. Removal of the eggs from the horse's coat may also reduce the survival of future generations. Probably the most important activity to reduce the potential for bot flies is to follow your veterinarians directions for routine worming. You veterinarian can advise on the potential for bot flies in your area, and can also recommend the timing of worming that will kill the majority of the bot fly larvae. Can a horse bot fly infect humans? On rare occasions, humans have been infected with bot fly larvae. The first stage larvae have been found migrating in the skin (cutaneous myiasis) and in the eye (ocular myiasis). Horse bots have also been reported in the stomach of humans. Because of this, you may want to wear gloves when removing bot eggs and should always wash your hands with soap and water after contact. Avoid rubbing your eyes or touching your mouth when removing bot fly eggs. Search the Internet for "bot fly" and you will find amazing and alarming pictures and videos of human bot fly infestation. Watch as a bot fly larvae wriggles through the skin on the forearm of a person. Should you be concerned? This depends on where you live. The human bot fly, commonly known as the Warbler Fly, is indigenous to Southeastern Mexico and extending South to the Northern area of Argentina. The horse bot fly can infect humans, but this is very rare. If you want to learn more about Bot Flies and how they may impact your horse, we highly recommend The Horse Bot Fly authored by Morgan McLendon and Phillip E. Kaufman of the University of Florida. The photographs used in this article are courtesy of the University of Florida.